Christians believe that the Bible is God’s word to us. That’s a pretty bold claim. But if it’s true, we’d better start really getting to grips with the Bible. Reading the Bible is a good start! You can just start at the beginning, but most people find it helps to work with a bible reading plan. 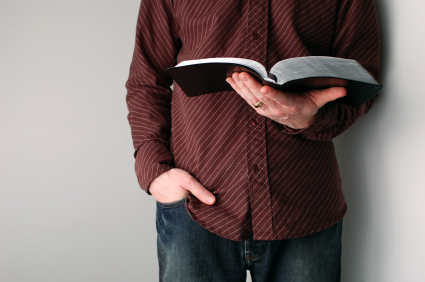 There’s another page with suggestions for personal prayer and Bible reading here. For those who have time when their bodies are engaged but their minds aren’t (ironing? driving? sitting on a train? ), listening to the Bible can be really rewarding. There are lots of audio bibles available, although be aware that many are read by American actors – The Bible Experience is worth a look though. For a British reading of the New Testament, Bible Society has a free programme called You’ve Got the Time, which includes a download of the New Testament read by the Riding Lights Theatre Company. If you want to go a bit deeper and do some real study, here are some suggested resources to help you. If you’re going to use paper books to study the Bible, you will find each of these four things really helpful. They are the basics for Bible study. If you’re shopping for a concordance you will find lots of references to “Strong’s Concordance” and “Cruden’s Concordance”. They have been faithful tools for Bible study for many years, but be aware that they are based on the King James version. To be honest, you may find it unneccessary to purchase a paper concordance, as this is something easily and reliably done for free online, at sites like Bible Gateway. If you do want to explore more detailed commentaries on individual books, there’s a huge range for every taste, budget, and theological position. Personally I’m a fan of the NIV Application Commentary series (NIVAC), the …For Everyone series, and the Baker Exegetical Commentary series. You can also get some great reviews on commentaries here. These apps include different versions of the Bible, and the first two offer some of the study aids I listed above. Be aware that although having these resources on your portable device is very convenient, the cost may be the same (or quite possibly more) than the paper based versions. Top of everyone’s bookmarks/favourites should be the excellent Bible Gateway. Umpteen versions in many languages, audio downloads, keyword search, devotionals, reading plans – it’s a must. Also very useful is the Online Parallel Bible, which also includes lots of (older) commentary. Plenty of other resources out there – use the power of Google! I do a lot of my Bible study on my computer now. I use Logos Bible software for some of it, which is very powerful although horribly expensive. The other three are considerably less both in cost and function, but are more than adequate for most folks. Also worth mentioning, because it’s a pleasure to use and the basic version is free, is Glo Bible. New International Version (NIV). This excellent translation is still the most widely used. The latest revision (as of 2011) includes gender inclusive language where appropriate. If in doubt, you won’t go wrong with the NIV. New Living Translation (NLT). The NLT is more of a thought-for-thought translation. Very readable, this is my favourite version for daily reading. English Standard Version (ESV). The ESV is more of a word-for-word literal translation – good for serious study, although maybe harder to get into the flow of reading. The Message. This is not a translation as much as a paraphrase into colloquial English. Also, it is written by one person rather than a team of translators; the other translations are done by teams. I don’t often use the Message for studying, but I enjoy consulting it for a fresh (sometimes very fresh!) take on a passage. Still loved by many, is of course the King James Version (sometimes known as the Authorised Version). Personally I wouldn’t recommend this, but if this is the version you’re used to and it speaks to your heart, great. Just be aware that the scholarship is now several hundred years old, and modern translations are much closer to the original text. Two final suggestions, both from Gordon Fee. How to Read the Bible for All Its Worth is an excellent and bestselling introduction to the skills and techniques of Bible study. Meanwhile, How to Read the Bible Book by Book gives an excellent overview of the Bible book by book and gives suggestions for reading each book to get the most out of it. With thanks to Joe Wittwer of Life Center Four Square Church for many suggestions in this post.